A “merry-go-round” is a small social organization where members contribute a small sum of money on a regular basis, often every week. Each time money is collected, the full sum is paid out to one of the members. The members take turns receiving the pay-out, so that after one full cycle, every member of the group has had a turn. By participating, members are essentially putting money away until it comes back to them as a larger sum. To decide the order of receipt – whose turn it is to receive the payout first and whose turn is last – the group members can draw numbers out of a hat. Andrew Youn started One Acre Fund in 2006. One Acre Fund supplies smallholder farmers with the tools and financing they need to grow their way out of hunger and poverty. Instead of giving handouts, One Acre Fund invests in farmers to generate a permanent gain in farm income. They supply a complete service bundle of seeds and fertilizer, financing, training, and market facilitation—and deliver these services within walking distance of the 180,000 rural farmers they serve. 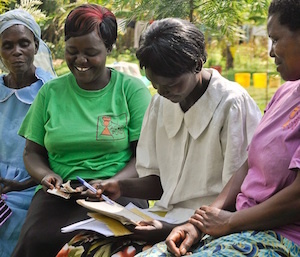 One Acre Fund measures success in their ability to make farmers more prosperous.